I have just finished teaching a 4-day Telepathic Immersion workshop in Taos, NM. In this workshop we connected to our Spiritual Guides and Enlightened Masters and learned how to receive their communication. We went deep into the natural world; worked with the Ancient Guardians of the land, and the nature Devic spirits and learned how to hear their wisdom. First day of our workshop. I will be offering this 4 day workshop at my home in New Mexico every September. I am also working on organizing my next workshop. Email me if you’re interested. 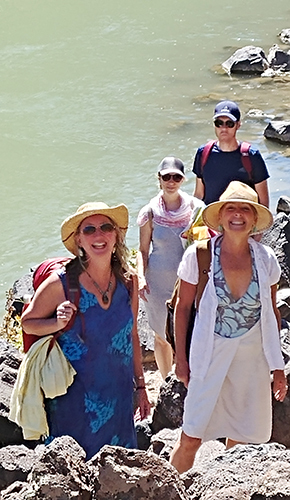 Connecting with the Deva of the Rio Grande. Hiking along the Rio Grande. An altar designed to ground the frequencies of our training. On the trail to the Black Rock Hot Springs. I have grown to have the utmost respect and trust in Lindsay and her special gifts. She is grounded, humorous and unpretentious, qualities that in my experience are often lacking in those who do telepathic work. I would recommend this training without hesitation. My biggest learning was that there is a vast universe available to us, vaster than vast in fact and that we are only tapping into a small portion of it. There is so much more to learn. Lindsay’s Telepathic Immersion was the best workshop I have ever been to. Lindsay is a fantastic teacher with a wealth of knowledge and experience. She made everything accessible, clear and easy to integrate. She was confident, relaxed, wise, articulate, full of gems and teachings, and such a total delight throughout. She had a sense of humor and compassion. She was excited to share with us what she has learned. She created a very safe and comfortable environment in which we participants could try new things. The design and flow seemed just right. There was never any tightness around time; we were all relaxed and totally present in an intensive learning environment. The lunches and snacks were delicious, healthy and abundant. The setting was beautiful, magical and very comfortable. I could not recommend a workshop from Lindsay any more highly. Go. This course absolutely helped me to believe in my telepathic abilities! Lindsay's teaching was one of the best courses I have ever taken in my 60 years of searching. She was precise, loving, clear and supportive all the way through these four days. If you are someone who is needing more support, more affirmation, more love around your telepathic skills, this is the teacher to go to! 100 percent for sure. My work with Lindsay has completely transformed my life. I feel loved and supported by the universe, am clearer about my life's direction and purpose, and I have a sense of peace as a result that is magnificent. I am eternally grateful and could never express in words the depth of transformation I am experiencing. Thank you Lindsay for your integrity, kindness, loving heart and dedication to this work in benefit of all beings. The combination of time spent communicating with our guides and time in nature felt so balanced and grounded. The places you took us were magical, sacred. It blew me away! I intend to use this work in my communications with land and plant spirits. I view them with much more respect. Also, when I go out hiking I feel more respect for the land I walk upon. Asking permission to walk in, leaving offerings, getting to know the Devas and spirits of mountains, plants, streams, trees, the Earth!….I feel that these beings have so much knowledge. During the workshop, a part of me awakened that had previously been covered up or dormant. It feels amazing to know that I am able to connect with spirit and receive messages in my own way. To live a happy life! To be in understanding of why I am here. I felt very loved and supported in the group to open this path in my life. I am so grateful to have had this experience in such an enchanted place.